Mix fruit with 1 cup sugar. 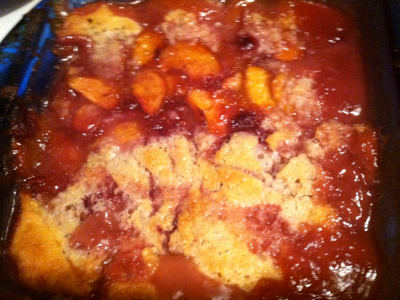 (Taste your fruit and if fruit is still sweet, just use about 1/2 cup sugar). Let stand. Put butter in a 2 quart or a 9 x 13 inch casserole dish. Place in 325 degree oven to melt. Combine remaining sugar, flour, and milk. Pour over melted butter. DO NOT STIR. Spoon fruit on top of flour mixture. DO NOT STIR. Bake at 325 for one hour. Enjoy!